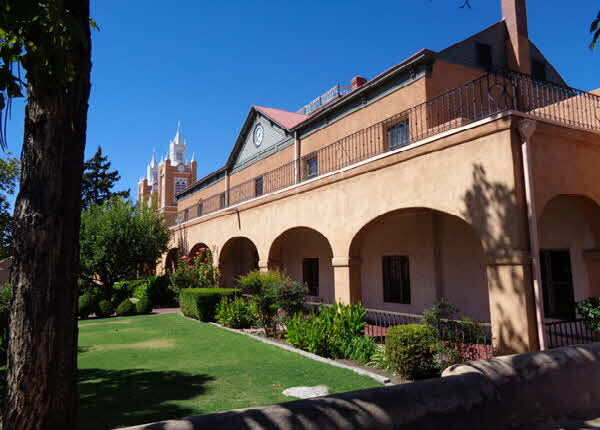 Santa Fe, with its very stable economy, continues to be a vibrant shopping and cultural mecca. Streets are lined with art galleries, museums and stores selling silver and turquoise jewelry. I check into the Eldorado Hotel & Spa, a Heritage Hotels and Resorts property; my well-furnished comfortable terraced suite offers impressive views. Executive Chef Jean-Pierre Vincent, or JP as his friends call him, has an amazing background. His old school techniques and classical training have taken him far in the culinary world... and around the world. “When I discover foods, I appreciate and love to eat, I go to that country to pick their brains and learn to cook their cuisines the authentic way they were meant to be cooked”. 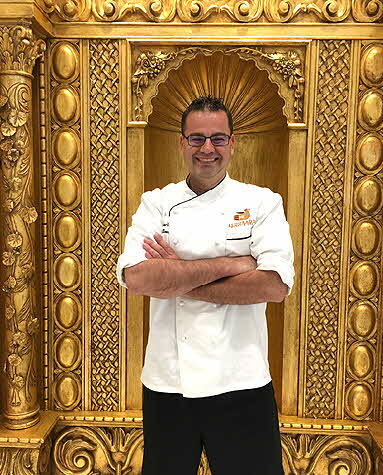 Jean- Pierre has honed his skills in Morocco, Egypt, Italy, Germany, France and Spain. His philosophy, “Simple food done well, and a good glass of wine. I do live my life spur of the moment; if it feels good, I do it, keeping my integrity with what I have regionally to use... and thinking in layers”. When we meet, he is busy tweaking his menu for Eldorado’s Duckhorn Vineyards Wine dinner that will be held during the Wine & Chili Festival. His five- course menu and wine pairings is impressive, and I regret I will not be in town to share in the festivities. 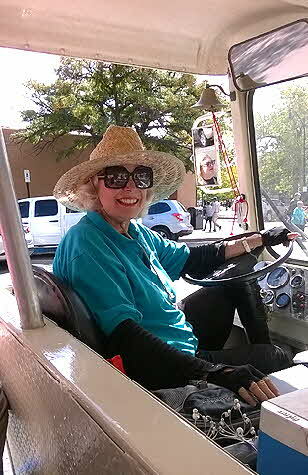 No visit would be complete without a personal and informative Historical Tour of Santa Fe with Tours by Clarice Coffey, an energetic blond mover and shaker who also offers custom group tours; her thriving event company plans and executes some of the most imaginative soirees in town. The tour begins and ends on the Plaza, and once I board, I am a captive audience to Clarice’s humor and wealth of local trivia. At the Canyon Road stop, Taos’ Rodeo Drive, there’s time to explore the galleries and shops. The Georgia O’Keefe Museum is but a few blocks from the Eldorado, and I relive this prolific artist’s life, wandering from gallery to gallery. Veronica Martinez, Principal of the Te Tsu Geh Oweenge Community School on the Tesuque Pueblo, drives me from Santa Fe to Taos, and on the way, we stop at the Pueblo to visit her school. I am intrigued with the afternoon program and 40 happy faces. 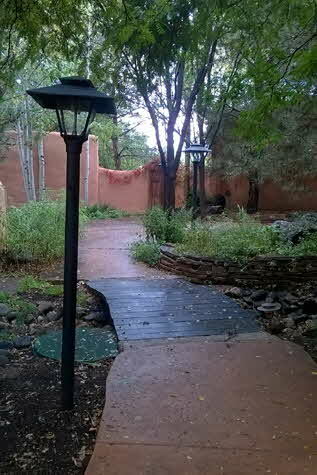 When we reach Taos, Veronica extends the honor of inviting me into her adobe, a beautiful home her father built. Taos was built on challenges; it is a vibrant living community of Native Americans, producing artists and gallery owners; its people have struggled for generations to protect their lands, preserve their traditions and survive the elements. The waters of the Rio Grande that flow through these sacred lands have many stories to tell … not all at peace with nature and the sacred spirits that hover over the hallowed earth, but of blood, sweat and tears shed to protect ownership. The Taos Pueblo Tribe of 2,500, one of the few Sovern Nations in the country, own 130,000 acres of land. The Tribal Council uses casino revenue to repair roads and other maintenance on the Pueblo. Ten families live within the walls without electricity or water... relying on the river, oil lamps and outdoor straw and mud ovens. Most have moved, seeking modern comforts, but return often to preserve their heritage and keep their homes in good repair. In the 1920s, 30s and 40s many artists were drawn to the Taos area to pursue a new, truly American art, devoid of industrial influence; inspired instead by New Mexico’s landscape, light and the traditional Native American and Hispanic cultures of the area. Mabel Dodge, a friend of Georgia O’Keefe, was one of these women who helped many artists find their way and their freedom. 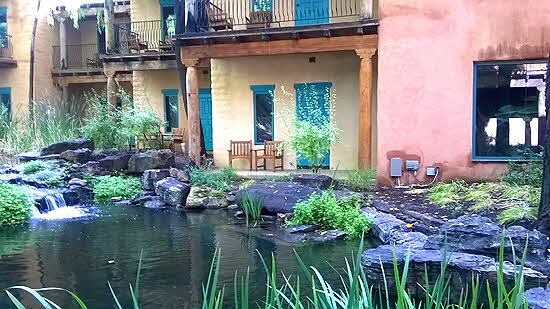 El Monte Sagrado Hotel & Spa, another Heritage Hotels & Resorts property, is a paradise waiting to be discovered... a warm and welcoming ode to the essence and spirit of Taos, and a charming sanctuary for the senses. My suite with brown leather couch, fireplace, and huge walk in shower, has two entrances; one off a walkway; the other opens onto a lush garden and pond with gurgling water. I follow a meandering path, lined with cottonwood trees, to reach the hotel’s Living Spa... presided over by Spa Director Heidi Gates whose goal is to align the potential of massage therapy with the future of holistic healing. “We provide genuine and heartfelt services to our guests from the moment they book their treatments; there is no such thing as a basic treatment here. Nurturing and therapeutic is our service mission. We are an eco-conscious green environment, placing the care of the planet in direct alignment with the care of our clientele. All our services have a healing modality at their core”. Three hours later, I emerge, like a butterfly from its cocoon, my skin cleansed, purified and polished; my spirit renewed and soaring. Christina Martinez, Executive Chef at El Monte Sagrado is the Mother Earth of cooking; drawing on what she learned in her grandmother’s kitchen; her dishes, a poem to the changing seasons, are aromatic, sensual and satisfying in their vibrancy of flavors and textures. “I add a little spice and earthiness to all my dishes. As much as I like simplicity, I tend to go more complex with a lot of detail and layered depth”. Her medium rare lamb chops, served with a zingy cranberry sauce and green tomatoes roasted with cayenne peppers were but two of the many ingenuous dishes she graciously prepared to please my palate. Bill Hartig, executive chef at Doc Martin’s Restaurant in the historic Taos Inn, serves me a perfectly cooked medium rare hanger steak with sides of red, white and purple roasted potatoes and crunchy chimichurri broccoli rabe. Stopping to chat, he tells me “I never stop trying to improve and work hard to keep moral high in the kitchen”. 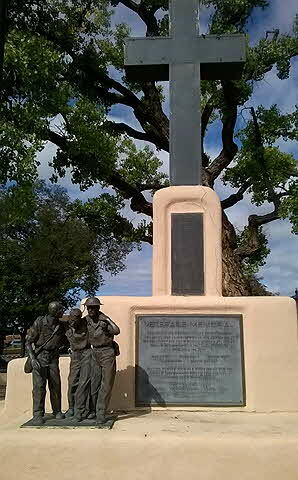 The Taos Plaza is a gathering place for locals and visitors. Manzanita Market, owned by Jennifer Hart, is an organic farm-to-table health food market, open for breakfast and lunch. Featuring home cooking, and working with local farmers, its mission is to create good & simple nutrient dense food. I order a bowl of corn chowder, thick with corn, tortilla chips and vegetables, and a warm turkey sandwich with chipotle spiced fig jam, creamy rosemary, Spanish ch�vre and balsamic greens... absolutely delicious. In addition to an organic food menu and homemade ice cream, the shop sells craft napkins, aprons, and essential oils. Dean Little Lake Johnson greets me when I enter his Smoke Signals Native Peace Pipes Shop. and shares a little history. “Before talking of holy things, we prepare ourselves by offerings, one will fill his pipe and hand it to the other who will light it and offer it to the sky and earth; the smoke tendrils that dance toward the Heavens carry prayers to the Great Spirit; they will smoke together and then be ready to talk”. The ceremonial pipe has always been the very semblance of tranquility and harmony that all those that truly walk the road seek amid a world of confusion. It is an honor to own a Native-made pipe; it comes with great responsibility; ceremonial pipes are for meditation and prayer, giving the “keeper” of the pipe great powers as long as he or she lives an “honorable life”. The Historic Taos Trolley Tour takes me out to the Taos Pueblo. I watch a 100-foot-high pole being erected for a climbing contest … a highlight of tomorrow’s sacred San Geronimo Festival. It begins to rain; the deafening roar of thunder and bolts of lightning electrify the sky; perhaps the spirits are cleansing the earth for the celebration of prayers and feasting. 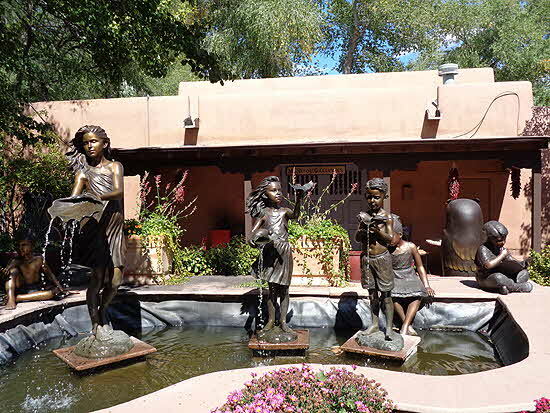 The Harwood Museum of Art has brought the arts of Taos to the world and the world’s art to Taos since 1923. In 1918, artists Burt and Elizabeth Harwood moved from France to Taos and purchased a property with several small adobe buildings. It became the town’s only library, and then from 1924 on, it was given over to exhibitions. Today, it continues to embrace new trends in American Art. 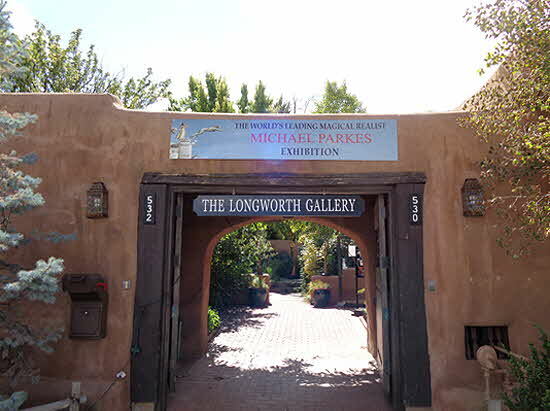 Its 12 unique galleries tell a comprehensive story of art in Taos: from the Taos Society of Artists to the Taos Moderns, from Pueblo to Hispano and from traditional to cutting edge... representing not only diverse artists and cultural traditions, but also how they influenced each other. The complimentary hotel shuttle takes me out to the Millicent Rogers Museum; I wander for hours, enthralled with the life and collections of this amazing fearless woman. Many strong women found their voice hiking the mountains, skiing, fishing and capturing Mother Nature at her purest: sketching and painting, inspired by the� freedom to express their inner fears and passions. Gallery owners David Mapes and Robert Parsons share the magnetism that has shaped their lives and livelihood in Taos. Robert Parsons, owner of the Parsons Gallery of the West and the Kit Carson Gallery, came to Taos in 1980 selling and collecting antique rugs. He tells me “the mountains and land of manana have accepted me. Being here is conducive to feeding the spirit; to being more creative. Young people who came in the 1900s set the stage for what Taos is now; you weren’t judged and you still aren’t. Taos is an incredibly social town; something happening every night. Every artist hanging in this gallery is known; and when buyers come through the door they know we’re established. I have left many times, but always come back. The magic is still here”. David Mapes, originally from LA, followed his heart to Taos 32 years ago. As a highly creative furniture maker, his designs blend art deco and art nouveau with New Mexico styles and history. Reclaiming 1860s floor boards, he recently turned them into an elegant embossed headboard. 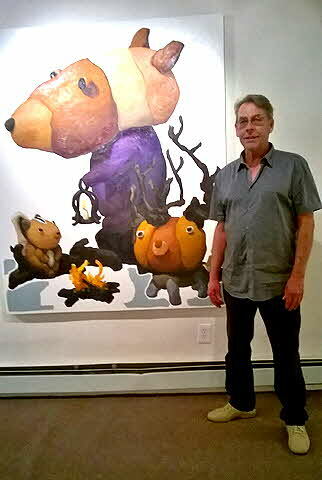 And as the owner of the David Anthony Fine Arts Gallery, David hangs the works of local and International artists. He tells me “I wouldn’t trade my life for anything; being here close to nature, the authenticity of personal relationships, and being surrounded by loving people who do not judge you for what you wear or the car you drive, nurtures my soul. It’s easy to live off the grid and not part of society; Taos is immune to happenings in other parts of the country. We share our love of place with our Native American neighbors, and respect their heritage and role as community builders”.. His latest challenge, mastering the art of animated videos as an innovative way to get people excited about art. I too feel myself drawn to the powers of Taos… like a moth to an open flame, and will long remember the magic that touched my heart.